There aren’t many things make me tear up the way they used to. A few years back it seemed like lots of things used to get to me. Grief was fresh, heartstrings wouldn’t just tug, they seemed to break. I would watch movies that were sad because they made me sad and I wanted to be sad. It sounds strange, but losing a spouse kind of makes you that way. But life continues to move. You either ride the conveyor belt as it rolls along or you walk the other way, stuck in place. I rode it and have come to a point where I’ve even jumped on other belts to keep moving forward. But the boy up there, the one smiling with the Niners sweatshirt on, has a way of coming out of the blue and surprising you. He certainly did it to me. Last-minute, due to my having completely ignored the school billboard announcing for weeks that school open-house was coming, my sons asked if I would go to open house. I, of course, did my hardest to go. I got home, grabbed the boys, jumped in the car, and we headed straight to school. Little did we realize that a small and intense thunderstorm was right over us. The lightning split the sky and as we got out of the car the thunder rolled over our heads like boulders falling down a hill. We got soaking wet, of course. There were projects, to be sure. Kites with their names and mottos of strength . . . written in Chinese . . . hung from the ceiling. Clay with cuneiform writing dried on the desks. Fractal artwork decorated the desks and my sons showed me the fractal geometry they had drawn on the dry-erase board at the front of the room. They shushed me and showed me the camouflaged butterflies that they had put all over the room, hopeful that the teacher would never find them. We saw reports on endangered species, artwork of Tucans, and tons of other pieces that did nothing short of impress me. But it was on the way out that I started to tear up. 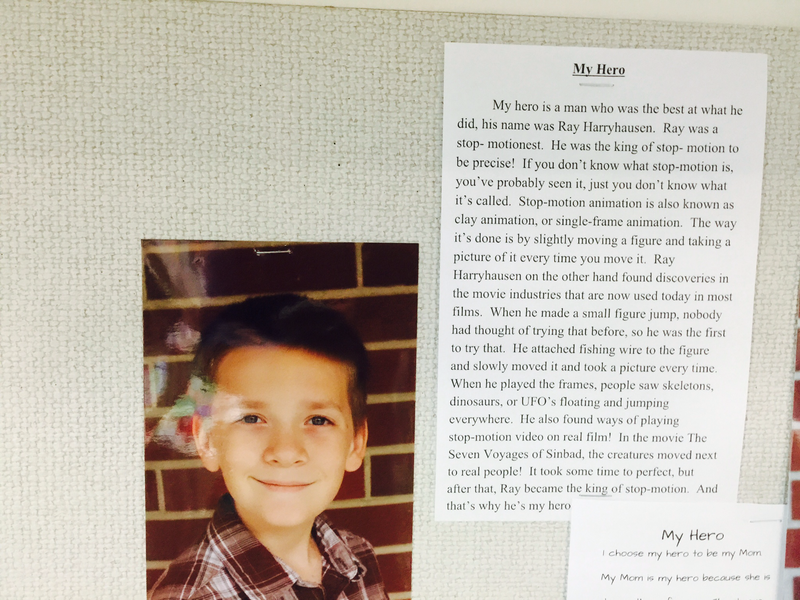 One son did what I anticipated…he picked animator, special-effects artist and director Ray Harryhausen. My son loves to make stop-frame videos and knows all about the animator and director. I was so proud of him, he had such detail and description in his note. I was beaming. “My Dad is my hero,” he says. It reads rather matter-of-fact. He likes the things I do…he loves that I met a Mythbuster. He says I do lifesaving stories. He adds that his aunt is another hero (with some fairly direct and unfiltered criticism of his cousins) and then his sister. It’s not an emotional note but it was for me. You see, if he’d said I had to do so much and was so busy and never had time…it would imply that I never have time for him. it would say that I have to do so much I don’t do things with him, too. 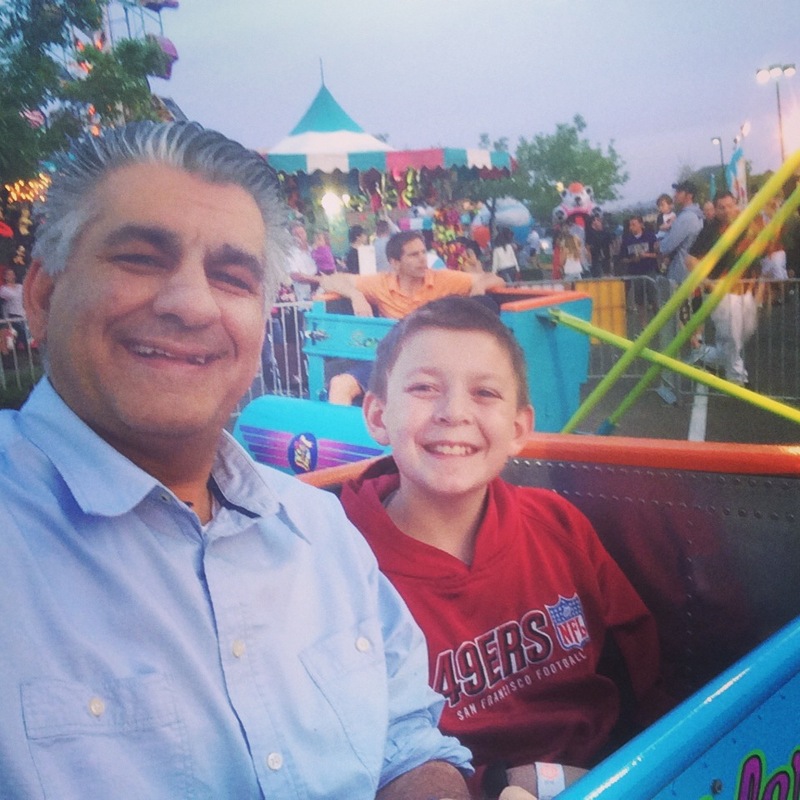 Instead…he sees me as a Dad, a career guy and someone whose company he admires and enjoys. I wrote about this in Rene Syler’s Good Enough Mother on Sunday. I have other heroes, sure…but added highest on that list…my son. He has lost his mother, had a hard time, lives with three other siblings, and he’s just the sweetest of kids. 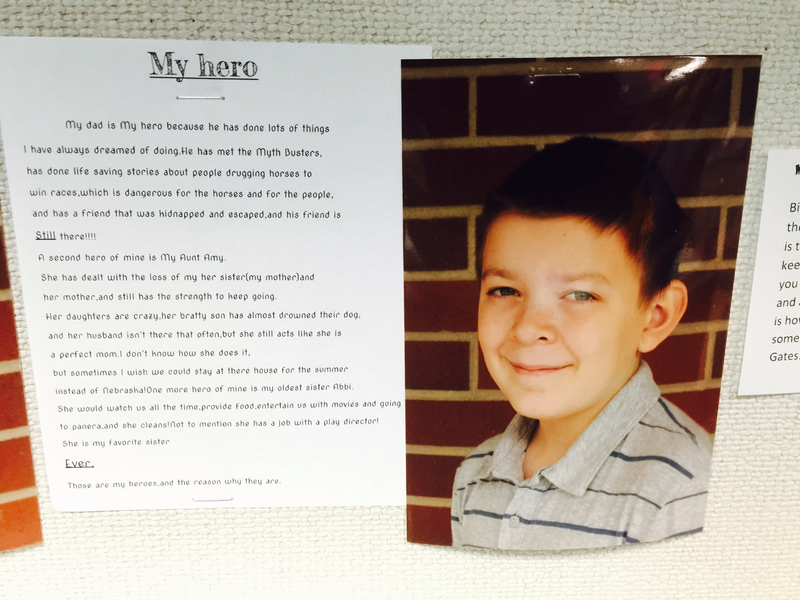 My son…he’s my hero as much as I might be his. Previous PostThe Loss of a KingNext PostNo, You Came Here for An Argument!